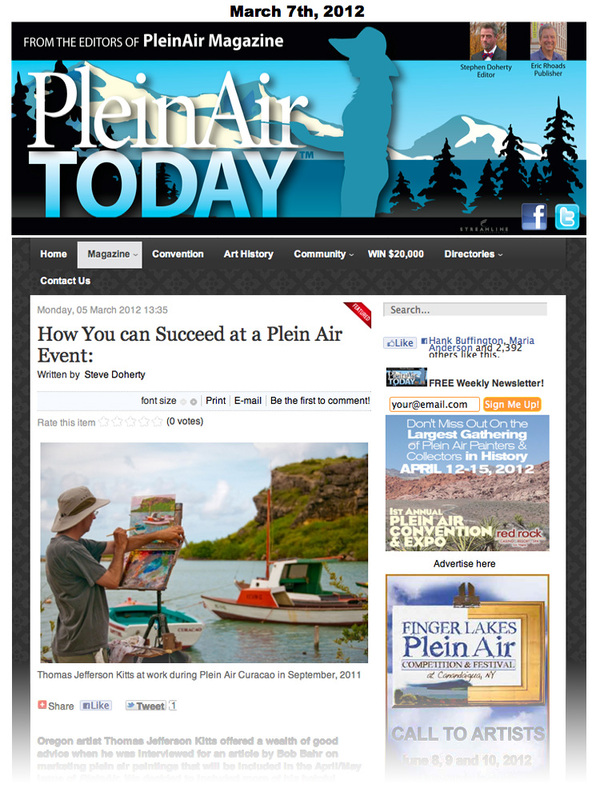 PleinAir Magazine picked up a post I meant to put up on the blog last month for one of their weekly e-Newsletters. You can click here to read the post as it was published, or read the same text below – should the original link-back to PAM break in the future. 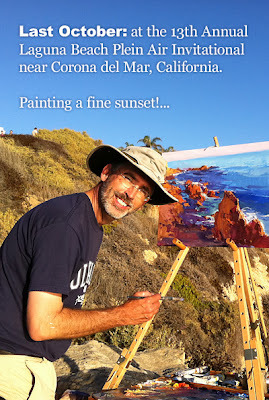 I hope that if you were pulled in but the e-Newsletter, and are new to my blog, that you will take a moment to drill down further and uncover some nifty oil painting tips and tricks. (Hey, here's an idea: why not subscribe to the blog and not miss a post?) If you have any questions feel free to post them in the comments area below. And now that the cat's officially been let out of the bag (see below) I can share that PleinAir Magazine will be offering a more in-depth article on what I've been up to lately. 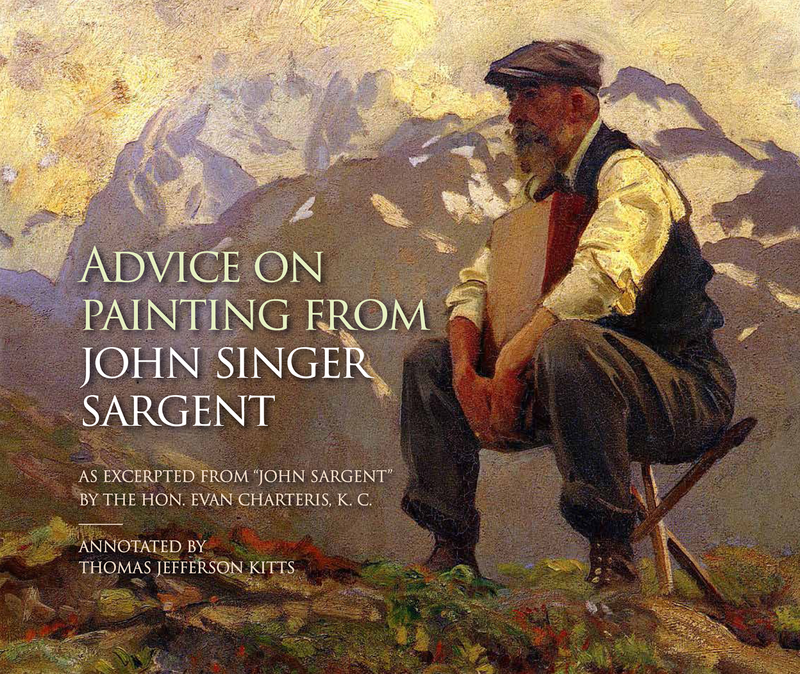 "Oregon artist Thomas Jefferson Kitts offered a wealth of good advice when he was interviewed for an article by Bob Bahr on marketing plein air paintings that will be included in the April/May issue of PleinAir. 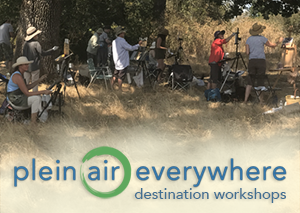 We decided to included more of his helpful comments in this issue of the PleinAir Today e-Newsletter. Kitts will be a valuable demonstrator during the Red Rock National Conservation Area during the 1st Annual PleinAir Convention & Expo." Yes it's me, photo-bombing my own picture! But Okay, What do You do After You've been Juried Into an Event? 2. Take a moment and feel great. It means somebody believes in your work. Next, call the event organizers to get more information. At this point they know who you are and they want you to succeed as much as you do. Ask about painting locations. Ask about framing preferences because they can vary by region. Ask about collectors, your fellow artists, your host, cheap-eats, the fly-in-and-out logistics, traffic, and whatever else that pops into your head. Learn as much as you can about what to expect. You want to be ready to go after check-in. You don't want to waste daylight. 3. Show up knowing there will be an element of competition, but maintain a sense of fun and respect as you engage. Laugh a lot. Be open and enjoy yourself because if you do you'll at least go home with that. Fun breeds more fun. Some of the best times you may have may happen between sunset and the nocturne you and your new friends decide to paint after dinner. And remember, you aren't just painting, you're networking too. 4. Understand that the competitive feeling you may experience is real, but manufactured by the event itself. I look at these paint-outs as the plein air equivalent to "The Iron Chef"™. Great art can result from such forced interplay, but don't lose sight of the fun as you go. People can sense that. 5. Appreciate how everybody around you is working to make something happen. You are creating art on the spot. Money is being raised for a non-profit. Paintings are being hung and buyers are leaving with something they will treasure forever. Everybody is happiest when everyone works together. You are a part of that. You may be the headliner (or not) but the volunteer who signed up to sweep the floor is important too. 6. Nobody likes a sad-sack. Nobody. Painting en plein air is hard enough under normal circumstances but doing it on demand around a cranky-pants only makes it tiresome. When you submitted you volunteered to work hard within a short period of time under pressure. So go out and do the best you can without bumming anyone else out. No matter what happens, keep a smile on your face and have fun. Did I mentioned the fun aspect enough times yet? Last year, at a big event, a friend's paint didn't arrive in time. Did he complain? No, everyone rallied around and gave him what he needed. That is less likely to happen if you are a moaner. 8. Enjoy the people you will meet: your fellow-artists, the event organizers, the collectors, your host, even the person on the street who has to share how much their great-aunt loved to paint puppies. (I have picked up a few nice commissions from such exchanges.) These events are extremely social. It's in the DNA. Every night will transform into a moveable feast so sleep when you get home. People will be genuinely interested in you so respond in kind. Be confident yet approachable. I have been painting en plein air for almost three decades but only began doing these competitions and invitationals back in 2010. I can't think of anything else I've done since then that improved my work more than these intense (and sometimes wild) events. Three years ago I took a workshop from a well-known painter and he suggested I give them a try and I am thankful for that push. If I had the past two years to do all over again, I'd not only do it I'd double-down and jump in earlier. Everyone I have met has been wonderful and I am grateful for their support and attention. For more information, visit www.thomaskitts.com. Great advice for all of life, enjoy, and have fun. I love your blog. Thanks. Now get out there and paint like there is something real at stake.